The blue Saltire can be seen being held aloft by fans of the home team, who let off flares outside the stadium beforehand, in Podgorica tonight. England manager Gareth Southgate named a young team for the Euro 2020 qualifier in Montenegro. But as the international match kicked off, fans were distracted by another sight in the stands. A Scottish flag can be seen being waved in the stands behind an Ultras banner. Many England supporters reacted in anger. 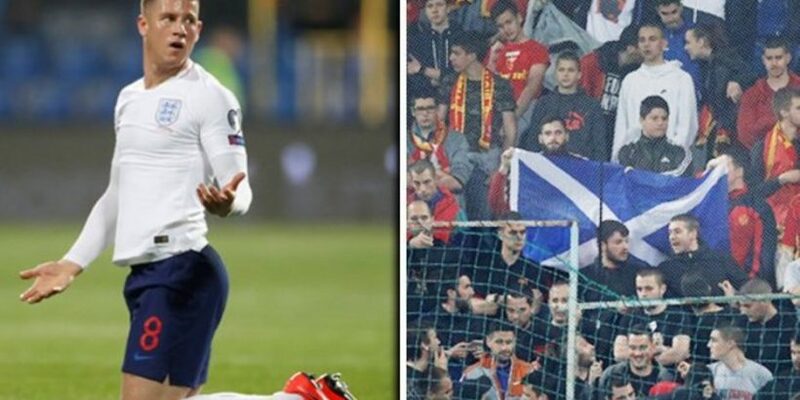 One said: “Scotland flag seen in the Montenegro end. And one more added: “England vs Montenegro and some t**t pitches up with a Scotland flag. While others were loving it. England’s Declan Rice and teenager Callum Hudson-Odoi were handed their first starts tonight. Both players earned their first caps when making substitute appearances in the 5-0 home win over Czech Republic in England’s opening qualifier on Friday. Chelsea forward Hudson-Odoi, 18, became the second-youngest England player to start a competitive international behind former Manchester United striker Wayne Rooney. He took the place of Jadon Sancho who dropped to the bench. Rice was playing in central midfield instead of Jordan Henderson – completing a remarkable few weeks for the 20-year-old. He last month switched allegiance from Ireland for whom he played three friendly internationals. The West Ham United player was forced to apologise last week after a Twitter message, posted several years ago, came to light in which he made a comment suggesting support for the Irish Republican Army (IRA). Rice said it was a “poorly expressed comment” made when he was a junior player. Regarding the team changes, Southgate said: “Jordan had a slight issue during the week so we can bring him from the bench if we need to, and Jadon has had a lot of football and Callum is fresh, so we wanted to freshen it up”. Midifielder Ross Barkley, who came on as a substitute for the injured Eric Dier at Wembley Stadium on Friday, kept his place while Danny Rose replaced Ben Chilwell at left back.